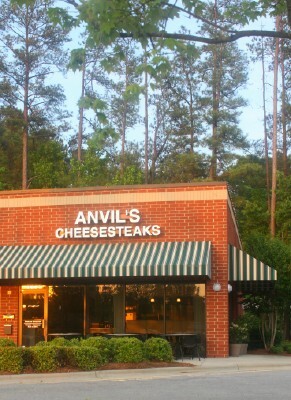 At Anvil's Cheesesteaks (2893 Jones Franklin Road; 854-0558; www.anvilscheesesteaks.com ), the emphasis is on authenticity rather than creativity. Bob "Anvil" Thompson, a Philadelphia area native, slices the beef for the shop's namesake sandwich every morning, grills it to order, and serves it on a freshly baked bun with aged provolone or American cheese, "wit' or wit'out" grilled onions. Thompson's wife, Barbara, serves up the sandwiches (other options range from grilled portobello to Italian chicken hoagie) with a generous side of chatty hospitality. Ask her about the picture of the giant Liberty Bell. Frank Y. (Yelp) Finally, a great Philly Steak Sandwich (outside of Philly) I rarely write reviews because creating accounts and getting spam is a pain. But after eating at Anvil's I just had to spread the word. I grew up in Philly and eating at Pat's in South Philly was a part of my up-bringing. I later moved on to Jim's Steaks on South Street as my favorite steak place. I left Philly in 1983, I have lived in several parts of the country, and have traveled widely, but I have never found a steak sandwich that tasted like an authentic Philly. Until a few weeks ago when I discovered Anvils, just 5 minutes from my house!!! This is the real deal. If you're from Philly, try this place. If you've never had a real Philly steak sandwich, try this place. Pros: Authentic Philly Steak Sandwich, delicious! Friendly owners Cons: none (well, they don't have beer, I love a cold beer with a hot steak sandwich). Barry L. (Yelp) There is a place in Reading Terminal in Philadelphia called Dinic's. They make cheesesteaks, of course, like so many others. But what they're known for is a roast pork, provolone, and broccoli rabe sandwich...a sandwich so good that many have said they'd swear off cheesesteaks forever just to eat it. I've never been to Dinic's. I've never been to Reading Terminal. But I watch A LOT of FoodTV and Travel Channel, and Dinic's (and their sublime pork sandwich) comes up a lot. I've wanted one for a long time, but its never been worth traveling hundreds of miles just to eat one. On the actual menu at Anvil's is one sandwich that's not on the website! A roast pork, provolone, sauteed spinach and pepper sandwich...almost like the one from Dinic's...only better, because I much prefer spinach to broccoli rabe. My planning, gone. As I type this, I don't honestly remember what I'd planned on getting. I simply knew, I was finally going to have a Philadelphia style roast pork sandwich. People...hear me on this one...it is AWESOME. Its juicy, its SUPER flavorful. Its very much the sub of my dreams. The bread is great. Everything is made fresh, so its steaming hot when it gets to the table. Anvil and his wife know what's good. They do sandwiches, chips, and drinks. No reason to confuse things. The one suggestion I'd make... they should cut the sandwiches in half. Besides that, I'm sold. I'm already thinking about my next trip. Oh pork sandwich...how I love you. P.S. Alex said the cheesesteak was great too. If I were you, I'd take his word for it. He knows his cow. David F. (Yelp) This is as close to the Real Thing that I have found. I'm always on the lookout for a good cheesesteak and now I have found a great one. Large portions and very tasty. Grilled onions, sauce, birch beer make me long for home. Highly recommended!